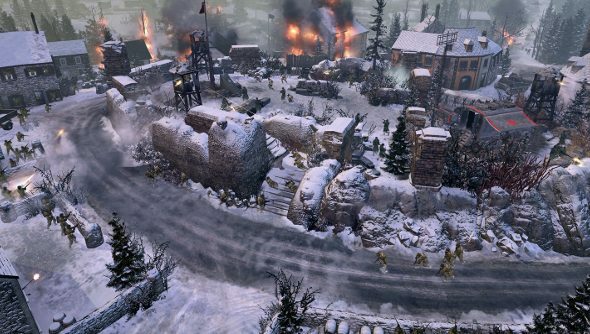 Company of Heroes’ multiplayer standalone expansion, Western Front Armies, was grand. It was an injection of life into the game, with two new factions that weren’t just reskins or a few new units, but armies with completely new mechanics with refreshing strategic philosophies. In my Western Front Armies review I said it was Company of Heroes 2 at its best. The lack of a single-player campaign wasn’t a problem, but Relic’s decided to make one anyway, which is certainly nice if you don’t really fancy competing against other players. Ardennes Assault brings back the US Forces and Oberkommando West from Western Front Armies, and throws them against each other in 18 missions inspired by the Battle of the Bulge. The missions will be played from the US Forces point of view, with the German mechanised beast serving as antagonist. But to keeping things interesting, there will be three brand new companies within the US Forces to choose from, each including their own unique officers and special abilities. It’s a dynamic campaign too, apparently. The impact of player decisions will affect the landscape, and choices like how to upgrade your forces will have long term effects, since all of those things carry over from mission to mission. Yep, there’s persistency, and that’s just lovely. You’ll be able to bugger off to the Ardennes come November 18th.